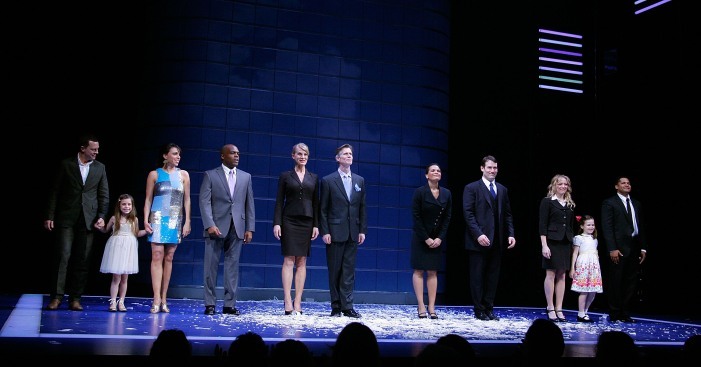 Castmembers appear on stage for curtain call at the Broadway opening of "Enron" at the Broadhurst Theatre on April 27, 2010 in New York City. Tuesday's announcement of the 2010 Tony nominations set off the usual closing reverberations, most spectacularly for "Enron." Lucy Prebble's lavish docudrama folds Sunday at a loss of $3.5 million-$4 million, making it one of the most expensive flops of a play in recent years. The production, directed by Rupert Goold, opened last month to largely unenthusiastic reviews, including downbeat notices from The New York Times and The Associated Press. It will close after only 15 performances and 22 previews. The play about the financial finagling and downfall of the Texas-based energy company received four Tony nominations, but was shut out of the all important best-play category, considered crucial by producers for drawing audiences. "Time Stands Still," Donald Marguiles' play about a passionate photojournalist, did get a best-play nod, and though it already has ended its limited nonprofit engagement, Manhattan Theatre Club said Wednesday it would bring the play back in September for another Broadway run. "Enron" arrived in New York with a fistful of rave reviews from England where it was first done at the Chichester Festival Theatre last summer before transferring to London. With an intricate, high-tech set, special effects and a large cast of more than a dozen actors, the Broadway production, particularly without a star in the lead role, proved to be risky proposition. A hit show in London doesn't automatically guarantee a rosy Broadway reception, and the reverse is equally true. For example, New York successes such as "The Drowsy Chaperone" and "Spring Awakening" didn't make it in London, although such musicals as "Hairspray" and "Chicago" proved popular in both places. In 2007, "Coram Boy," a hit in England for London's National Theatre, died quickly in New York. The expensive melodrama filled with the music of Handel and adapted from a young-adult novel by Jamila Gavin, reportedly lost $6 million.